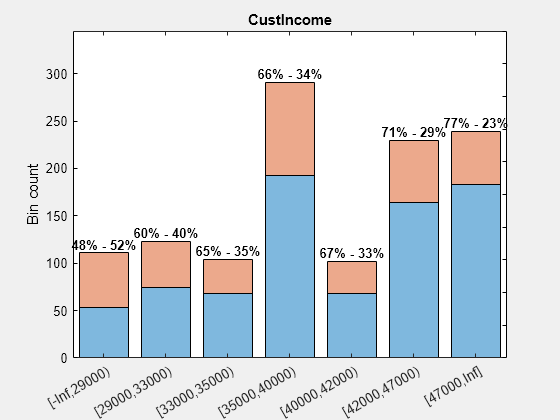 plotbins(sc,PredictorName) plots histogram counts for given predictor variables. When a predictor’s bins are modified using modifybins or autobinning, rerun plotbins to update the figure to reflect the change. hFigure = plotbins(sc,PredictorName) returns a handle to the figure. plotbins plots histogram counts for given predictor variables. When a predictor’s bins are modified using modifybins or autobinning, rerun plotbins to update the figure to reflect the change. hFigure = plotbins(___,Name,Value) returns a handle to the figure. plotbins plots histogram counts for given predictor variables using optional name-value pair arguments. When a predictor’s bins are modified using modifybins or autobinning, rerun plotbins to update the figure to reflect the change. Create a creditscorecard object using the CreditCardData.mat file to load the data (using a dataset from Refaat 2011). Perform automatic binning for the PredictorName input argument for CustIncome using the defaults for the algorithm Monotone. Use bininfo to display the autobinned data. Manually remove the second cut point (the boundary between the second and third bins) to merge bins two and three. Use the modifybins function to update the scorecard and then display updated bin information. 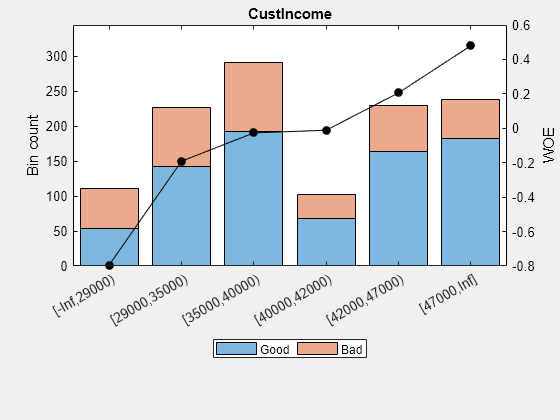 Plot the histogram count for updated bin information for the PredictorName called CustIncome. Plot the bin information for CustIncome without the Weight of Evidence (WOE) line and without a legend by setting the 'WOE' and 'Legend' name-value arguments to 'Off'. Also, set the 'BinText' name-value pair argument to 'PercentRows' to show as text over the plot bars for the proportion of "Good" and "Bad" within each bin, that is, the probability of "Good" and "Bad" within each bin. Create a creditscorecard object using the CreditCardData.mat file to load the data with missing values. Use creditscorecard with the name-value argument 'BinMissingData' set to true to bin the missing numeric or categorical data in a separate bin. 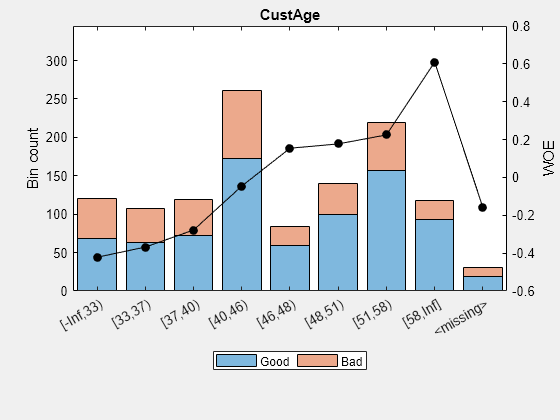 Display and plot bin information for numeric data for 'CustAge' that includes missing data in a separate bin labelled <missing>. 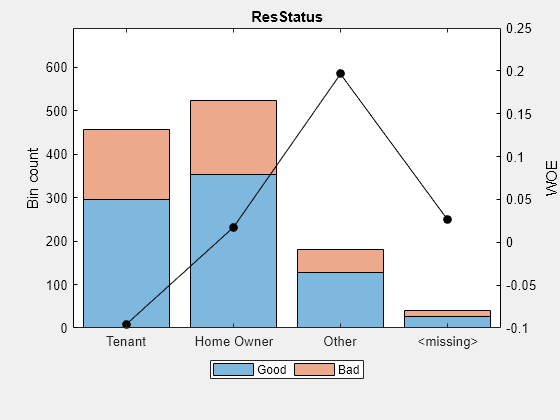 Display and plot bin information for categorical data for 'ResStatus' that includes missing data in a separate bin labelled <missing>. Credit scorecard model, specified as a creditscorecard object. Use creditscorecard to create a creditscorecard object. Name of one or more predictors to plot, specified using a character vector or cell array of character vectors containing one or more names of the predictors. None — No text is displayed on top of the bins. PercentRows — For each bin, displays the count for “Good” and “Bad” as a percentage of the number of observations in the bin. PercentCols — For each bin, displays the count for “Good” and “Bad” as a percentage of the total “Good” and total “Bad” in the entire sample. PercentTotal — For each bin, displays the count for “Good” and “Bad” as a percentage of the total number of observations in the entire sample. Indicator for Weight of Evidence (WOE) line, specified as the comma-separated pair consisting of 'WOE' and a character vector with values On or Off. When set to On, the WOE line is plotted on top of the histogram. Indicator for legend on the plot, specified as the comma-separated pair consisting of 'Legend' and a character vector with values On or Off. Figure handle for histogram plot for predictor variables, returned as figure object or array of figure objects if more than one PredictorName is specified as an input. Anderson, R. The Credit Scoring Toolkit. Oxford University Press, 2007. 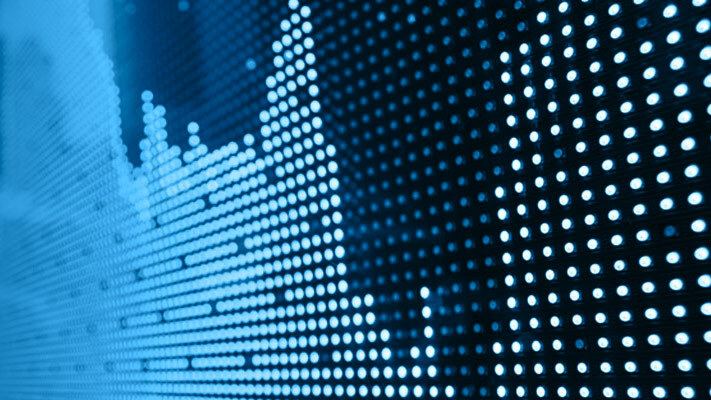 Refaat, M. Credit Risk Scorecards: Development and Implementation Using SAS. lulu.com, 2011.